I can’t believe another year of Pomegranate Week has come to an end. Considering the amount of pomegranates I have consumed in the past two weeks while working on these recipes, I am not, by any stretch of the imagination, tired of eating pomegranates. If anything, I want more!!!! 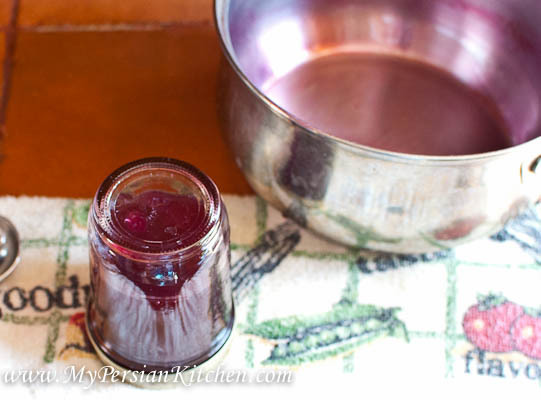 Today’s recipe is adapted from one of the Italian recipe books that my sister sent me earlier this year called “Marmellate e Conserve.” As soon I saw their Pomegranate Jelly, I knew I had to make it. This recipe is fairly easy to make and it is really yummy! The flavor of the quince is very subtle while pomegranate certainly takes center stage. I think that this jelly goes well with chicken, turkey, and the other white mean, pork. 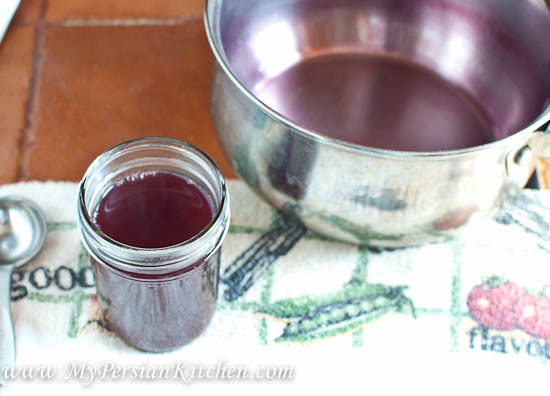 This is a great alternative to cranberry sauce for Thanksgiving as well. 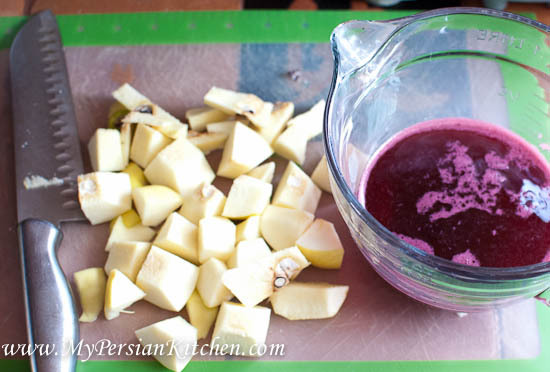 Juice pomegranate and rough chop quince. 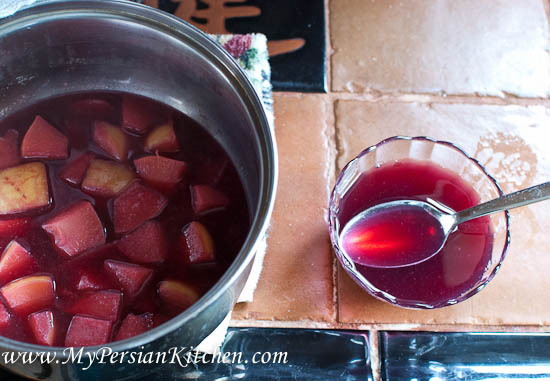 Reserve 1/4 cup of pomegranate juice. 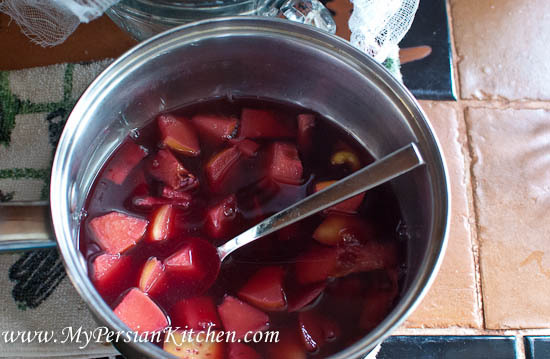 Place 3/4 cup pomegranate juice and quince in a pot add 1/2 cup water and simmer for 20 minutes. 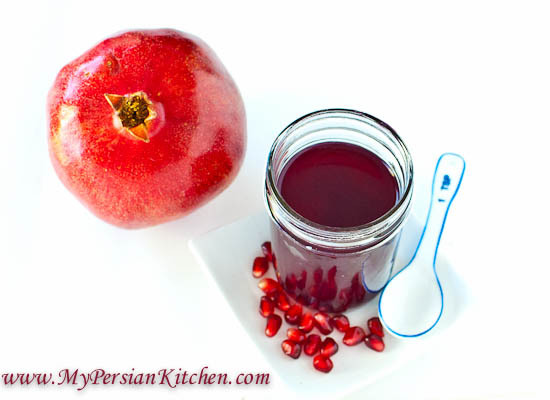 Place the 1/4 cup of pomegranate juice in a small bowl or measuring cup. 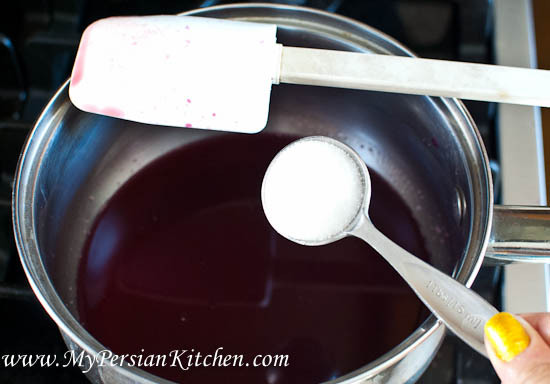 Add unflavored gelatin and let stand for 1 minute. 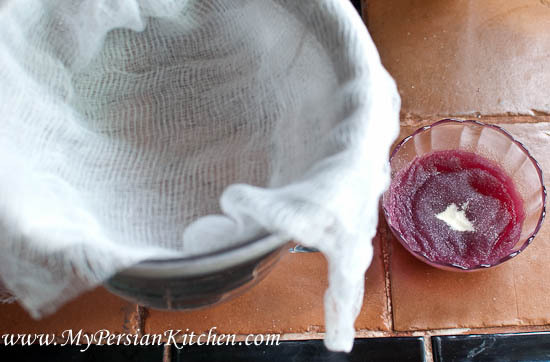 In the mean time line a colander with a cheesecloth folded a couple of times over and place it over a glass bowl. 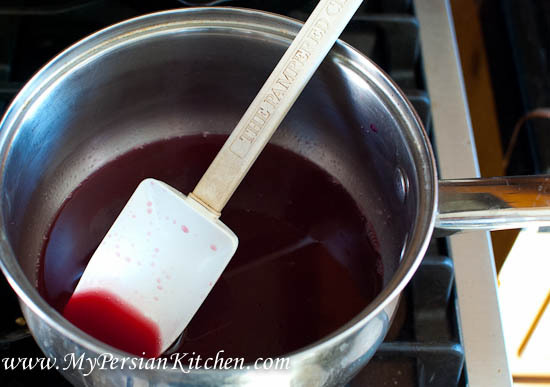 Add 3 to 4 tablespoons of the warm pomegranate juice to the bowl or measuring cup with the gelatin and mix well. Then add back to the to pot. Mix the juice well making sure that the gelatin has dissolved. 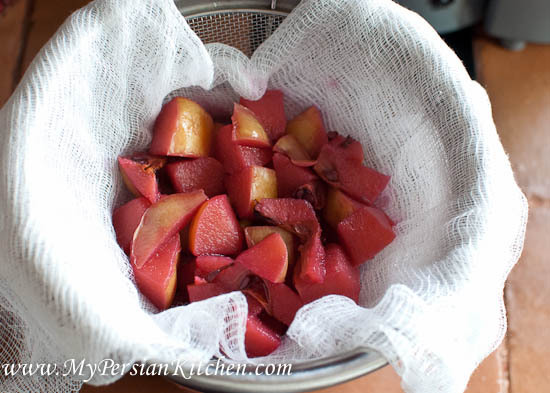 Pour the juice and fruit in the colander and fold over the cheesecloth. Allow to stand over night. 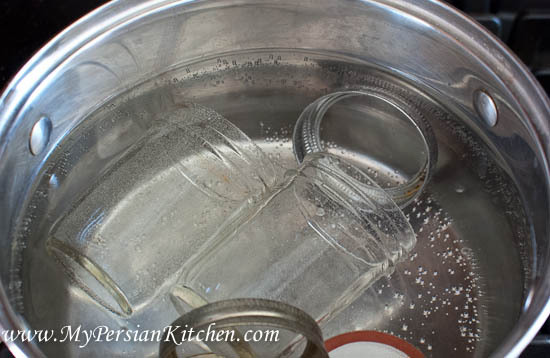 Place an 8 oz glass jar in boiling water for about 10 minutes. Carefully remove from boiling water and dry completely. In the mean time, discard the fruit. 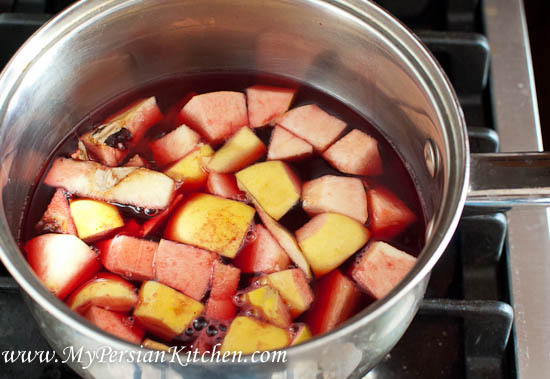 Place the juice in a pot and bring back into a liquid form. Add lemon juice. 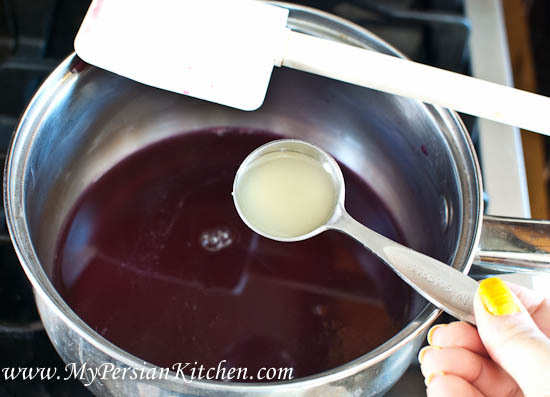 Stir constantly to make sure that the sugar is dissolved. Continue cooking for 10 minutes longer. While the jar is still hot pour the juice in it. Close the lid shut and flip it upside down for 2 minutes. Allow to sit over night at room temperature to firm up. Keep in a cool and dark place and consume within a month. Once open store in the fridge. Affiliates link included within post.